Providing you the best range of brass precesion parts with effective & timely delivery. We manufacture and supply an extensive range of Brass Gas Parts. These brass gas parts have a high tensile strength and maximum durability as well. 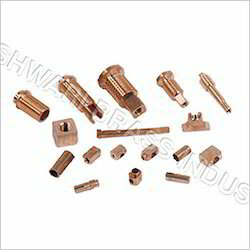 These parts are made using finest quality brass. Dimensionally accurate, the entire range is precision engineered. Made available in various sizes, we also offer customization as per the clients’ requirements. This cost effective range is highly demanded in the market.